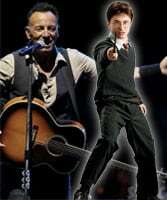 A song that Bruce Springsteen wrote for his eldest son and offered to the director of the first Harry Potter film has surfaced online. Hear the beautiful ballad "I'll Stand By You Always" and get the director's explanation for the heartbreaking decision he made to leave the song out of the film. Bruce Springsteen shows off hot body on Brazil beach before 64th birthday! The 12.12.12 Sandy Relief concert was epic with over 2 billion people watching and a million iconic artists!